How about joining me for some eggs and bacon on toast with some melted cheese? My youngest son and DIL live in Dallas and they have a chicken coop, and they recently shared some of their eggs with me. I'm using my Old Britain Castle plate and teacup for Memorial Day. Aren't these eggs so pretty? They're even prettier in person. The egg yolks are much brighter than store-bought eggs. My son cures and smokes his own bacon, and slices it with an electric meat slicer. This particular bacon was espresso and maple flavored. Oh my, was it ever fabulous and the best bacon that I've ever tasted! My son likes to use hickory wood for smoking the bacon. I love using my cast iron skillet that I bought at a garage sale over forty years ago. I toasted some of my sourdough bread that I've kept going for 12 years now. The starter was given to me from someone that said it had originated in the Civil War. I put lots of grains, bulgur wheat, whole wheat and unbleached flour in it. This was truly a delicious meal! Happy Memorial Day and thank you to all of those who serve our country and those who have served! Happy Memorial Day, Kitty! You know I adore red transferware so I am loving your teacup and plate today! I like the spray of posies inside the cup too; very sweet. Your bacon, eggs, and cheese on toast looks delicious. What a treat your sourdough bread must be. Twelve years is a long time. I've done cake and muffins for a while but never as long as that. Great accomplishment! Thank you for sharing and joining me for tea today. I hope you have a fabulous week, my friend. Now that's a delicious looking breakfast to enjoy with a cup of tea. Yum! 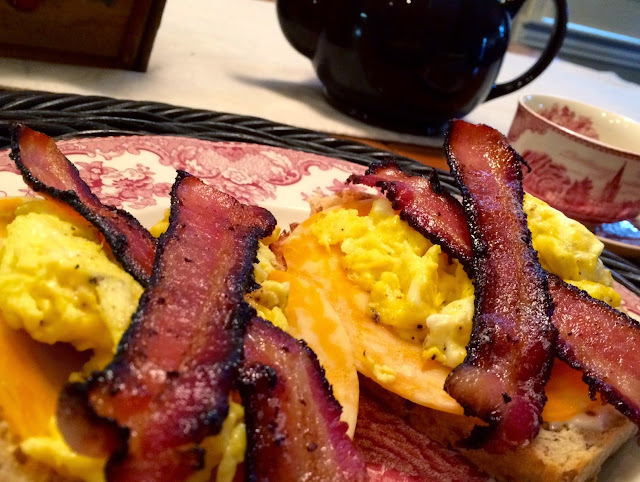 Fresh eggs and home-cured bacon are the best. I love a hearty breakfast and yours looks quite delicious and hearty. I've always had store bought eggs and have been wanting to purchase some farm eggs at our local farmers' market. Others have commented on the color and noticeable great taste of these eggs. I'm curious about them. I think it would be wonderful to have chickens. Our neighbors have a coop and I enjoy hearing the chickens in the morning. Hope you are enjoying the three day weekend. Delicious! We make those sometimes for supper, too! Love your red transferware. Beautiful! Thanks for linking to Tuesday Cuppa Tea! YUM - now that is a truly awesome holiday breakfast. Neat about your bread, too! So glad your son smokes bacon - way to go for sure! Kitty I can imagine that breakfast just being the best tasting ever! How wonderful for you to get to taste something so fresh. Love that you have kept the bread starter going for so long. And I think Cast Iron Pans are the best; they can last forever. Happy Memorial Day to you. Happy Memorial Day, Kitty! Your breakfast made my mouth water! The maple bacon reminded me of the maple bacon (usually served on top of the icing) cupcake which was a yummy combo on sweet and salty. My goodness! It sure doesn't get any better than homegrown EVERYTHING! Even the bread? What a perfect meal. It looks just lovely and all your beautiful dishes dress it all up so nicely. Happy Memorial Day to you Dear. Our daughter sent 2 dozen homegrown eggs home with us when we visited them this weekend...now all we need is some of that 'homemade' bacon! And homebaked bread...=) How awesome! What a wonderful breakfast! Love your transferware too. Perfect for Memorial Day! What a perfect meal. That home smoked bacon sounds really good. I wonder if that's hard to do. My husband makes good smoked meat but has never made bacon. Holy wow Kitty, farm fresh eggs and homemade bacon! I just can't imagine how good that must be! Happy Memorial Day, what a way to celebrate! I have a friend who has just bought 2 loaves of sour dough bread from the farmers market and it cost her $7-00. Too much to pay for any sort of bread I think. There's nothing like farm fresh eggs! I've been buying mine from a lady that has 'yard hens' and what a difference in taste! I love eggs...and breakfast foods! Enjoy your day! Hugs! Kitty you've got me wanting a bacon and egg sandwich! It sure looks tasty and fresh from the farm. This looks awesome, Kitty, and as usual you're making me so hungry!! :-D I love the Old Britain Castle dishes; I need to get some teacups and saucers -- I only have mugs and they're not as pretty. ;) Your son is certainly talented to smoke and slice his own bacon -- wow! I love a good old-fashioned bacon and egg sandwich, but mine never look this good. The eggs are beautiful with the colorful shells. Take care, Kitty, and have a good day! Yum! This is my kind of breakfast, Kitty. Hope you had a good day. Your's was as likely as wet as our Memorial Day. We are safe and dry, but Austin was hit hard. Posted about it this morning. Kitty, what time will breakfast be ready tomorrow? That looks just scrumptious! I do love a good breakfast and you know how to cook one! And farm fresh eggs, wow! Wow you are making me hungry right now for that bacon and eggs! It looks so delicious! Hope you have a nice week! A delicious-looking breakfast. That bacon sounds wonderful, and I can see how yellow those eggs are. And so great you've kept that sourdough starter going for so long. That's commitment! Oh yummy. Eggs & bacon are some of my favorite foods. Yummy....nothing better than good, classic comfort food! Looks wonderful! What a sweet and delicious breakfast. I love it - unique! I am totally a bacon person. I'll be right over for breakfast, sweet friend :) Aren't fresh eggs so mush better than store-bought?! My mother-in-law and neighbor both have chickens and weekly we get some - it's such a blessing. This looks soooo good. Aren't fresh eggs the best? I only know 1 person who keeps chickens these days and do not often get fresh from the farm. They are pretty though aren't they? And richer tasting I think. I use Nellie's Cage Free eggs - certified humane from small farms. Worth the price I believe. Kindness Matters. Even kindness to chickens. Angels to you Kitty ! Oh, that bacon looks incredible! This just makes me laugh because I had some of the most incredible smoked bacon at a restaurant last year and thought I should try and smoke some myself! Well, I put it in the smoker and came out a while later and flames were shooting up two feet from the smoker. I could have caught the house on fire! If I hadn't been so scared I could have taken photos for the blog!! Obviously, I didn't have a clue on how to smoke my own!! Nothing beats the taste of farm fresh eggs and the bacon looks incredibly good and so crispy. Oh yum! My hubby has a work friend that sends farm fresh eggs home with us now and then. They are delicious! But wow, smoking his own bacon? Boy does it ever look good! We do have some yummy bacon that we get from a little meat shop. Love your pretty dishes Kitty! Thanks for sharing with SYC. Wow what a great smell to get up to, there is nothing like bacon frying in the skillet. Isn't the sunshine just fabulous, at last!! Thanks so much for sharing your awesome post with Full Plate Thursday, I just pinned this recipe it looks so good! Hope you are having a great week and come back soon!